These biscuits were a great addition to our Thanksgiving table this year. I’ve made these biscuits a couple of times now, and I’ve rolled them out to different thicknesses. When I roll it out thicker, they are light, airy, and flaky biscuits (pictured). 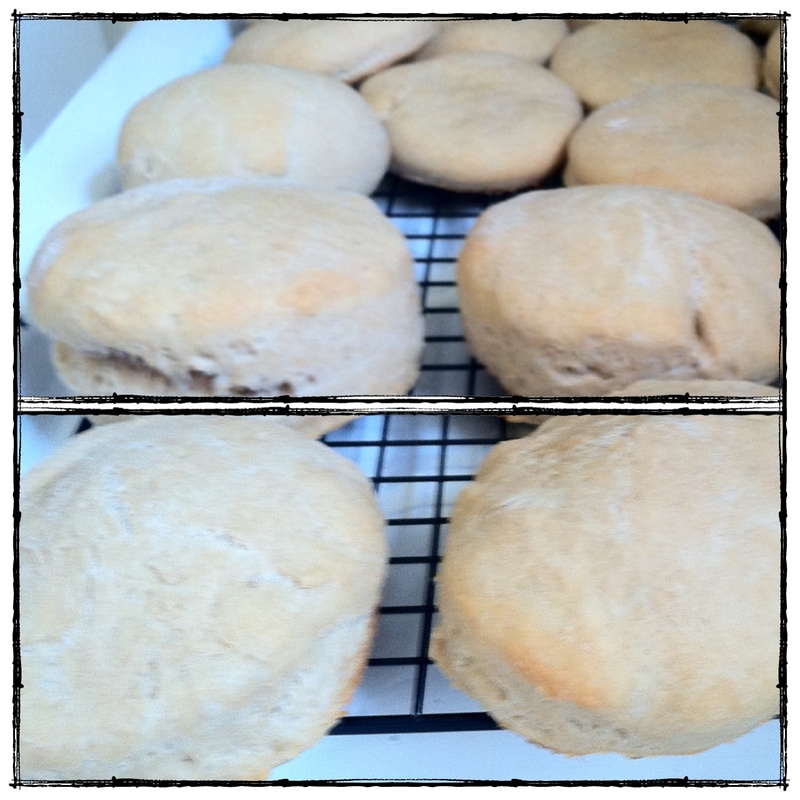 When I roll it out thinner, it yields a more dinner roll like biscuit, rather than the flaky biscuit. I rolled them thin for Thanksgiving since husband requested “rolls” and not biscuits. Everyone was happy and I got way more biscuits than anticipated by rolling the dough out thin and doubling the recipe. I also brushed them with melted butter before putting them in the oven. These freeze beautifully and go great with eggs and bacon for breakfast! This was a fun one to make with kids, Jonah loves cutting out the biscuits for me! 1. Preheat oven to 450. 2. In a medium-sized bowl mix together your dry ingredients. 3. Cut the cold butter into little pea sized pieces and mix the pieces into the flour mixture. I used my hands to mash the butter pieces as I mixed it with the flour until it resembled coarse crumbs. 4. Pour in the milk and stir to combine. 5. Knead the dough with your hands (or you could also do this with the dough hook attachment on your mixer) and then turn out onto a counter or cutting board. Roll it out flat with your hands or a rolling-pin until the dough is ¾-inch thickness (I had to sprinkle with a little flour to make my dough less sticky). 6. Now you’re ready to cut out biscuit rounds. You can turn a glass or a mason jar upside down to get round biscuit shapes, or your favorite cookie cutters. My 5 year-old did most of the biscuit cutting. He’s the best helper. 7. Put the biscuits on an ungreased cookie sheet and bake at 450 degrees for 10 – 12 minutes or until lightly browned. **Adapted from 100 Days of Real Food.